The Baltimore Sun has reported on that the city has kept in place the "School Zone" signs, and the speed camera, for Cardinal Gibbons High School school which closed in June. "Now, the parking lot off Desoto Road is filled with the vehicles of employees of St. Agnes Hospital, not school faculty. But yellow "school zone" signs at the intersection of Wilkens Avenue and Desoto still remind drivers to slow down, and a red light and speed enforcement camera monitor their behavior. William Debord, who lives in the Morrell Park neighborhood, drives his grandson past the former Gibbons campus through that intersection to Mount St. Joseph High School, and he often sees the speed camera flash when drivers turn right on red. A sign bars right turns onto Desoto between 8 a.m. and 4 p.m. — traditional school hours. "I think it's ridiculous to have it that way now," Debord said. "There's no school there." He's never gotten a ticket there himself, but thinks the camera should go." 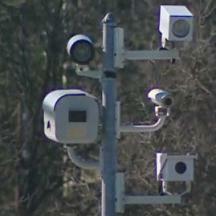 Spokeswoman Adrienne Barnes for Baltimore's Department of Transportation said that the speed camera still falls within a half-mile radius around other schools. The city claimed that there were two other schools within a 1/2 mile radius of this location, however when the Sun looked up the named locations on a map they concluded that those facilities were farther than 1/2 mile away. City officials of course disagreed with that conclusions so the camera remains, 4 months after the grounds of the school it was placed for became a parking lot.